We’ve just passed the Thanksgiving and Hanukkah/Christmas season, our modern harvest and solstice celebrations, and celebrated them with — if you’re like most people — family feasts: turkeys with all the trimmings for Thanksgiving, latkes on Hanukkah, perhaps a Christmas ham. Perhaps you went around the table taking turns to acknowledge all you were thankful for, or perhaps you began the meal by saying grace. In Jewish households, brachot are recited before meals and birkat ha-mazon afterwards to acknowledge God, the creator and sustainer of all things. Christians households recite grace before meals, thanking the Lord for blessings bestowed. First, seventy-two labors have brought us this food. We should know where it comes from. Second, as we receive this offering we should consider whether our virtue and practice deserve it. Third, as we desire the mind to be free from clinging, we must be free from greed. Fourth, to support our life, we receive this food. Fifth, to realize the way, we accept this food. The gatha is extracted from the elaborate, formal oryoki ritual described in excruciating detail by Dōgen in his Eihei Shingi, written in 1237 C.E. Unlike its Judeo-Christian counterparts, the gatha isn’t an homage to a deity, but an attempt to establish one’s frame of mind for the meal to come. The first contemplation makes mention of seventy-two labors. In the elaborate division of labor within Japanese monasteries, seventy-two positions, from the abbot to the cook, contribute to the conduct of monastery life. Seventy-two labors is a metaphor for acknowledging that our meal doesn’t come to us miraculously like Athena sprung fully-formed from the head of Zeus. Instead, innumerable labors contributed to it — farmers raised the produce, middle-men packaged, transported and sold it, family members prepared it, and an even larger cast of supporting characters built our kitchen appliances, constructed our electrical grid and gas pipelines, and provided the farmer’s seed and fertilizer, tractors and combines. While we’re at it, lets also acknowledge the vital contributions of the sun, the earth, the rain, the atmosphere, and pollinating insects. This meal arrives at our table by virtue of innumerable contributors. It’s an opportunity to both acknowledge the interconnectivity of all life, and to express our gratitude for it. The second contemplation is an open inquiry into whether our day has been aligned with our vows and intentions, and whether we’re living out our aspirations in accordance with the Dharma. Are we worthy of this meal? The 8th century sage, Baizhang Huaihai, used to say, “a day without work, a day without eating.” Out of all the schools of Buddhism, Zen is perhaps unique in viewing manual labor as integral to practice. Work not only provides the wherewithal for our sustenance, but offers us opportunities for whole-hearted, mindful activity, erasing the dividing line between the secular and the sacred. So the question of whether we’ve earned this meal has both worldly and ultramundane implications. Have we contributed to the world through our labor, and have we contributed to the process of realization through our vows and intentions, through our zazen and our wise and compassionate activity? The third contemplation is a truncated restatement of The Four Noble Truths — suffering comes from clinging and aversion, and liberation from overcoming greed, hatred, and ignorance. Meals are an opportunity for practicing non-greed — to eat what’s needed for our health and well-being, but not more; to accept the meal as is without comparing it to other meals we’ve enjoyed in the past; to be grateful for whatever has come our way. Unlike countless millions around the world, today we aren’t starving. We aren’t suffering from malnutrition. Can we be grateful for “enough” and “good enough,” even if this meal, right here, right now, isn’t our favorite? Even if it’s too cold, too overdone, too whatever? We suffer today from diseases of too much — diabetes, obesity, high blood pressure, and cardiovascular disease. Just enough is better. The fourth and fifth contemplations are statements of why we eat — the fourth, a reminder that we eat to live, the fifth that just living is not enough — that we eat to fulfill our vows and realize the Way. The historical Buddha spent years fasting and practicing extreme austerities before discovering that mortification of the body yielded not enlightenment, but emaciation and exhaustion. He attained enlightenment only after ceasing his austerities and embarking on a “middle way” between abstinence and greed. In the Buddha’s day, monks begged in the morning for food, eating once daily, and accepting whatever they received with gratitude. They ate enough to sustain themselves and their practice, but without becoming attached to tastes and preferences. This is a far cry from our contemporary epicurean focus on deliciously prepared food as a cornerstone of la dolce vita. Gourmands eat to enjoy, dazzle the palate, and sate the senses. Buddhists eat to cultivate practice. 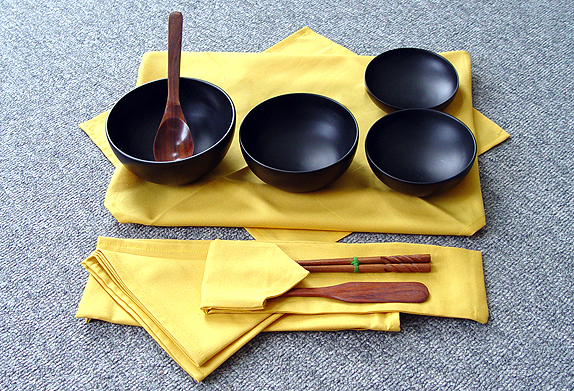 Dōgen’s Eihei Shingi instructs the monastery cook to give exquisite, mindful attention to the process of meal preparation, but to treat all the ingredients with equanimity. In preparing food never view it from the perspective of usual mind or on the basis of feeling-tones… If you only have wild grasses with which to make a broth, do not disdain them. If you have ingredients for a creamy soup do not be delighted. Where there is no attachment, there can be no aversion. Do not be careless with poor ingredients and do not depend on fine ingredients to do your work for you but work with everything with the same sincerity… A rich buttery soup is not better as such than a broth of wild herbs. In handling and preparing wild herbs, do so as you would the ingredients for a rich feast, wholeheartedly, sincerely, clearly. When you serve the monastic assembly, they and you should taste only the flavor of the Ocean of Reality, the Ocean of unobscured Awake Awareness, not whether or not the soup is creamy or made only of wild herbs. In nourishing the seeds of living in the Way, rich food and wild grass are not separate… Wild grasses can nourish the seeds of Buddha and bring forth the buds of the Way. Do not regard them lightly. A parent raises a child with deep love, regardless of poverty or difficulties. Their hearts cannot be understood by another; only a parent can understand it. A parent protects their child from heat or cold before worrying about whether they themselves are hot or cold. This kind of care can only be understood by those who have given rise to it and realized only by those who practice it. This, brought to its fullest, is how you must care for water and rice, as though they were your own children. In engaging in this practice, Dōgen asserts, one cultivates a heart as vast as a the ocean. This vast heart does not regard a gram as too light or five kilos as too heavy. It does not follow the sounds of spring or try to nest in a spring garden; it does not darken with the colors of autumn. With right view and right intention, everything becomes practice — shopping, cooking, eating, and cleaning up after — the whole world, a cauldron for our awakening. I hope you’ve had a joyous holiday season, surrounded by loved ones, enjoying the bounty of the earth. Some of you may have spent the holidays alone, having but a few grains of rice to eat. Whatever your condition and circumstance, may every moment be an opportunity for awakening, may every moment be an opportunity to benefit others. And may the new year be an opportunity to renew and sustain your practice for the benefit of all beings.